The SkiWelt is one of the most affordable and largest interconnected ski areas in the world, found in the stunning Wilderkaiser mountain range. The 'Ski Welt Ski Area' was voted best ski resort in the world for 2009 by Ski Resort Service International out of 70 top ski resorts. The SkiWelt-Wilderkaiser area is home to the villages of Ellmau, Scheffau, Söll, Hopfgarten, Westendorf, Brixen, Going and Itter. Comprising 279 km of piste (the longest run is 10 km) and 91 lifts there is plenty to keep everyone happy. The ski area boasts 70 ski huts, resturants and apres ski bars so there is one on average every 3.9 km. Although the highest lift is at 1825 metres and the lowest at 620 metres the SkiWelt boasts a strong snow history, and if needed, there are over 1000 enviromentally friendly snow cannons which cover 180 kms in 3 days. Ellmau is a beginner and family friendly resort with a village atmosphere yet the second largest resort in the ski domain. Accommodation in Ellmau is scattered across the resort but accommodation is affordable for Austria. It’s picturesque with tree-lined runs, a pretty church and chalet style buildings. Söll is a small welcoming village with a compact resort centre and its local slopes take a walk or a short bus ride to get to so it’s not for those looking for ski convenience. The town is a lot livelier than its neighbour Ellmau but still retains its village feel with its classic Austrian style buildings despite exceeding its size. Arguably the most picturesque resort in the SkiWelt region, Scheffau is a traditional Tyrolean style village at the foot of the Wilder Kaiser Mountains. It’s a great resort for intermediates although not the most convenient village to access the lifts. For the sunniest spot in the SkiWelt, Hopfgarten sits in a wind-protected basin in the Kitzbühel Alps. It is also known to have the best views over the valley than any other resort in east Tirol. 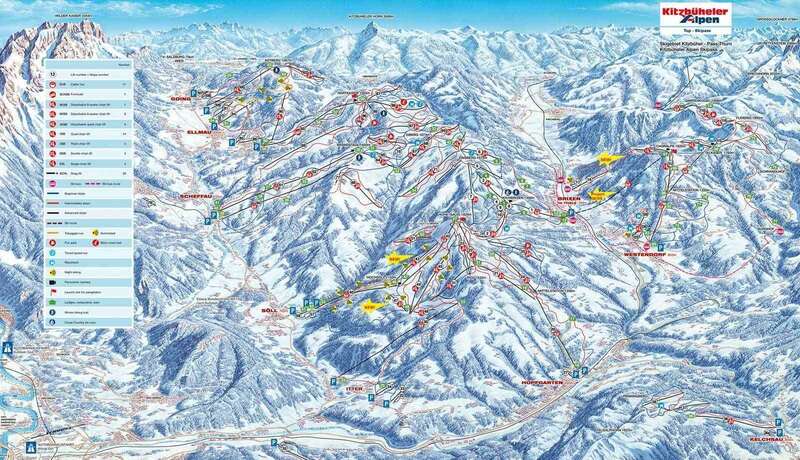 Slightly off the main SkiWelt circuit is Westendorf. It's situated on a plateau and its slopes are less busy than other resorts in the area. It's slopes are perfect for confident intermediates and it has good links to Kitzbühel. SkiWelt is largely an intermediate domain with numerous tree-lined blues and cruising reds that allow you to ski for miles across the mountains, especially in good snow conditions. Beginners will find beginner ski areas dotted in the ski area, with the exception of Hopfgarten and Brixen. Scheffau and Ellmau are the bestb resorts for first timers and families. Scheffau has an extensive array of blue runs on the outskirts of the resort and down into Brandstadl as well as specific novice areas. Ski schools in Ellmau also have a good reputation and have a wider selection of nursery slopes in resort. The SkiWelt is limited in its advanced pistes, with only 6% black runs in the area. For advanced skiers looking for more challenging slopes and off-piste thrills, Westendorf is the best resort for that. There are also some tougher runs around Brandstadl and beneath Hohe Salve slopes are generally steeper and great off-piste sections. Have a watch of our SkiWelt resort video guide to see what the area has to offer. Staying in the SkiWelt ensures for a relaxed and picturesque holiday in authentic Tyrolean style accommodation. Accommodation is made up mostly of Austrian guesthouses and pensions.We have a variety of hotel options in a number of its resorts to suit you as well of plenty of activities off the slopes such as igloo village, toboganning, funparks and more.